The astronauts' molded couches lean against NASA's model shop wall in late 1959. 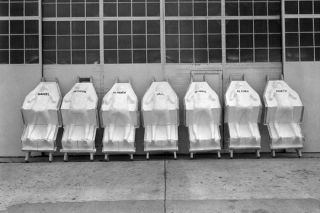 In this historical photo from the U.S. space agency, molded astronaut couches line the NASA Langley Research Centers model shop wall. The names of the test subjects (Langley employees) are written on the back. The couches are similar to those made for each astronaut and fitted into the Mercury capsules for manned spaceflight.